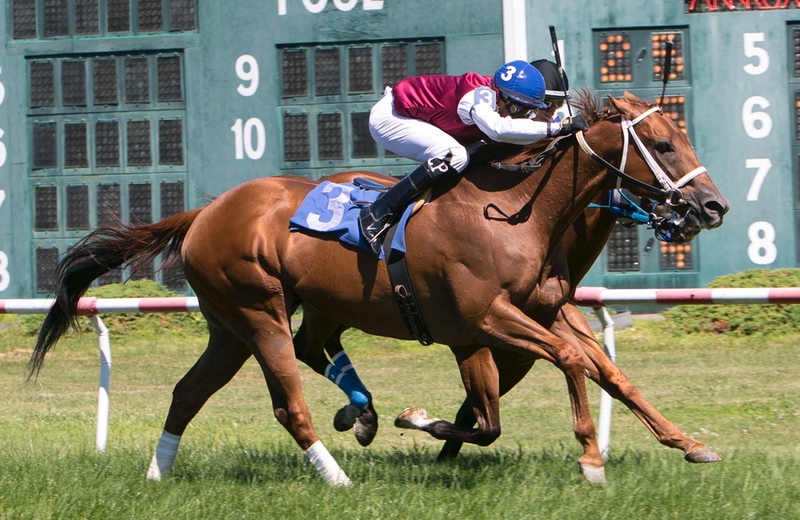 East Boston, MA — Live racing returned to Suffolk Downs on Saturday, July 7th as the track held the second of three scheduled weekend-long racing and food truck festivals. A crowd of 8,110 was on hand for the thirteen-race card. Dr. Blarney started the day with an emphatic victory under jockey Tammi Piermarini in the $50,000 Last Dance Stakes which was contested as a non-wagering event. The five-year-old gelded son of Dublin, bred in Massachusetts by owner Joseph DiRico has won 14 of his 20 starts and has now claimed three consecutive editions of the Last Dance Stakes. Also on the card, veteran Khan of Khans notched his 30th victory of his impressive 108 start career. Trained by Dylan Clarke and owned by his mother, Anne Clarke, the twelve-year-old gelding broke alertly and went to the lead under jockey Luis Perez. He opened up a two-length advantage as they turned for home and dug in gamely to prevail by a neck at the wire to complete about five furlongs on the turf in :59.17. A chestnut son of Storm Boot bred in Kentucky, Khan of Khans made his debut in the fall of his juvenile year and broke his maiden the following summer. He has raced continuously since then and has compiled a record of 30-20-7 from 108 starts with $412,397 in earnings.